A January evening colder than a witch’s teat. (No offense, Margot Adler!) Setting out the trash can at FirstNerve Manor would require excavating a niche in the curbside snowpack. With current temperatures, there’s little chance of a foul odor brewing before the next pickup day, so we’ve decided to avoid exertion and take a pass on the Friday collection. Meanwhile, the temperature kinetics of decay may account for the astonishing total of zero new ISDP items for the past month, although there were three last January. 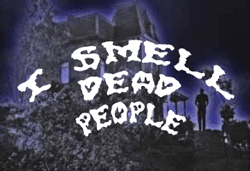 The best we can do is note that the Mahoning County Coroner’s office in Youngstown, Ohio, has promised to conduct its smellier autopsies after working hours in order to avoid the “foul odor” that prompted office workers elsewhere in the building to take a sick day and head for home. 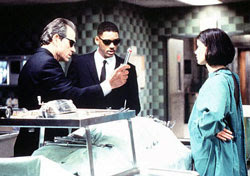 The episode reminds us of Linda Fiorentino’s character in Men in Black. And therein lies the solution: Use the flashy-thingy and tell the folks upstairs that they’re smelling swamp gas reflected in the light from Venus. Warren P. Straniti, 36, of Fernandina Beach, Florida, for cohabiting with his deceased girlfriend for about one week at the Buccaneer Villas without notifying police—or anyone else. Alan Derrick, mid-seventies, of Bristol, England, for hiding the body of his illegal public housing roommate under an overturned couch and continuing to live with it for the next ten years. The family of Sogen Kato, 111 (? ), until recently thought to be the oldest living man in Tokyo, for leaving Mr. Kato’s body undisturbed in the house from his death around 1980, in order to collect government pension payments. The 57-year-old woman from Corona Del Mar, California who let a homeless lady sleep in her car and then kept her there under a blanket for months after the lady passed away. The 31-year-old tenant who refused to let suspicious police into his Houston apartment because he said his mother was sleeping, when in fact she was deceased and her remains were in an advanced state of decomposition. Wow—a tough decision for the Academy of Post Mortem Arts & Sciences. The Kato family clearly has the longest record, but did they even look in on the patriarch after the first year or so? The lady from Southern California would be a shoe-in if, as Drudge intimated, she really had been driving around with the deceased in the passenger seat; but we can’t be sure of that from press accounts. The fellow in Houston sounds like he may have been unhinged; a Norman Bates Award winner needs to show deliberate planning. That narrows it down to Walter P. Straniti and Alan Derrick. Mr. Straniti’s case is dark and somewhat suspicious, but Alan Derrick clearly takes the cake. He actively hid his roommate’s remains and managed to deflect repeated inquiries by government busybodies social workers. Thus, for outstanding duration of Batesian behavior, and for indirectly highlighting the idiocy of Britain’s social welfare state, the 2010 Norman Bates Award goes to Alan Derrick. P.S. Mr. Kato’s family wishes everyone to know they feel it was an honor just to be nominated.